Back when we reported on the super-guano Kawasaki Ninja H2R track-only hyperbike, we mentioned that a roadgoing Ninja H2 would likely follow in short order. Indeed, that’s the case, and it will in fact be revealed to the public tomorrow at the EICMA show in Milan. However, Ulfert Janssen of Gannet Design couldn’t wait that long to offer his take on Kawasaki’s supercharged street screamer, and has already cooked up the concept you see rendered here. 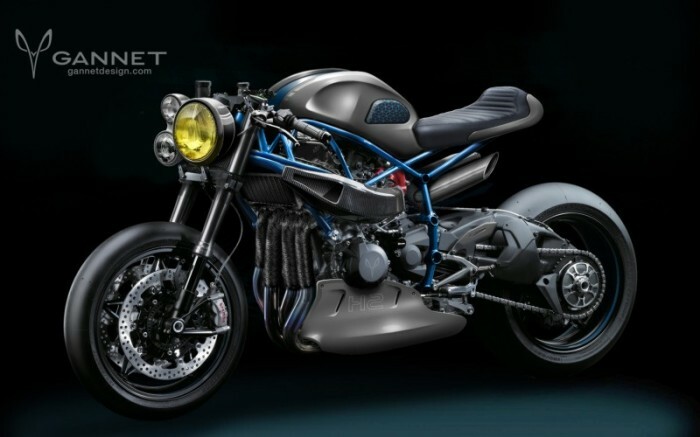 Almost completely devoid of bodywork to showcase the trellis frame and fitted with a trio of front lights, this naked monster is as artful as it is aggressive. We’re still looking forward to seeing the stock H2, but we know there’s no way it will measure up to this thing.